Our seven-week road trip through the American West started with us driving from Woodstock, GA to Yosemite National Park (in California). Our route west includes about 1,900 miles of Interstate-40, from Nashville, TN to Barstow, CA. About 1,200 of those miles, from Oklahoma City to Barstow, closely follow historic Route 66. Route 66 was one of the first U.S. Highways, established in 1926. While we did not set out to drive Route 66, it has been unexpected fun! The history and nostalgia found along the way is interesting and entertaining. To break up the drive a little, we decided to stop near Flagstaff, AZ for a couple of nights. After two full days of driving, we desperately needed the break! We chose this particular stop for a couple of reasons. 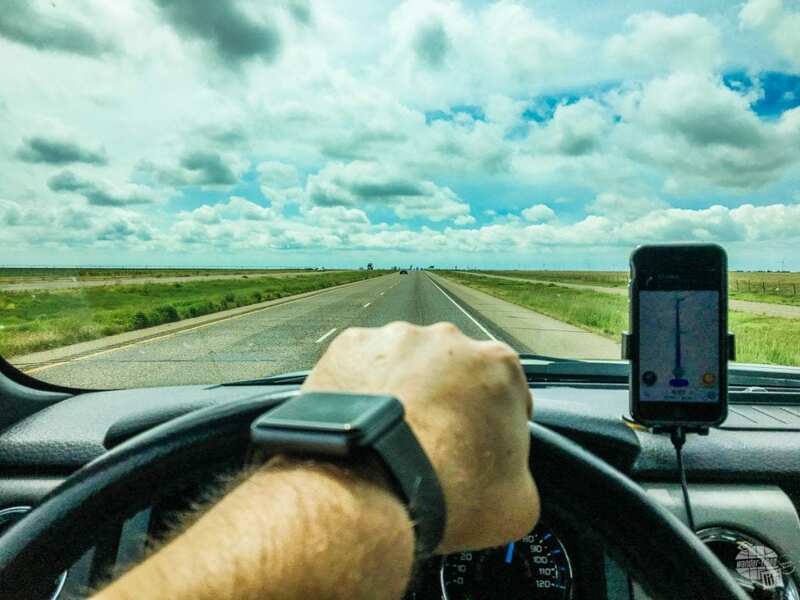 The view on the road in Texas is long and wide open. A colleague told us about Meteor Crater, which is about 40 minutes east of Flagstaff. It sounded interesting, so we decided to add it to our itinerary. There also are several national monuments in the area, which we always love visiting! 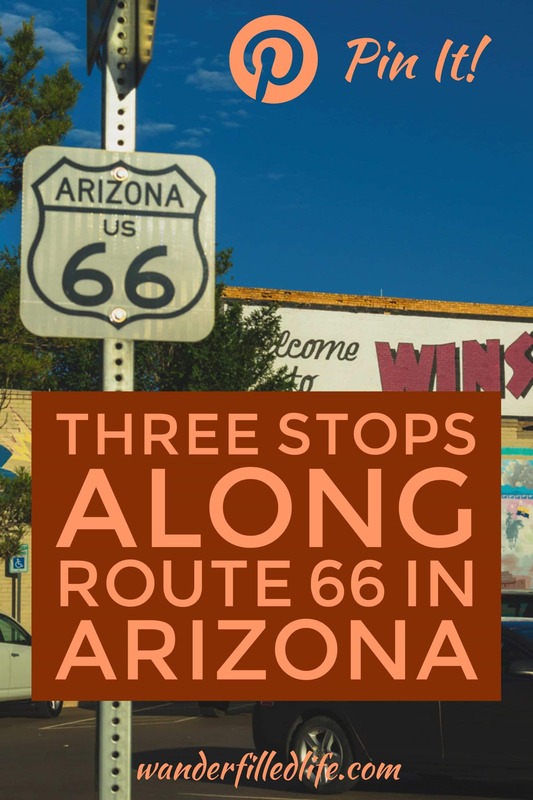 There are many stops along I-40 and Route 66 that you can visit. Here we highlight three in northeastern Arizona that are definitely worth your time! 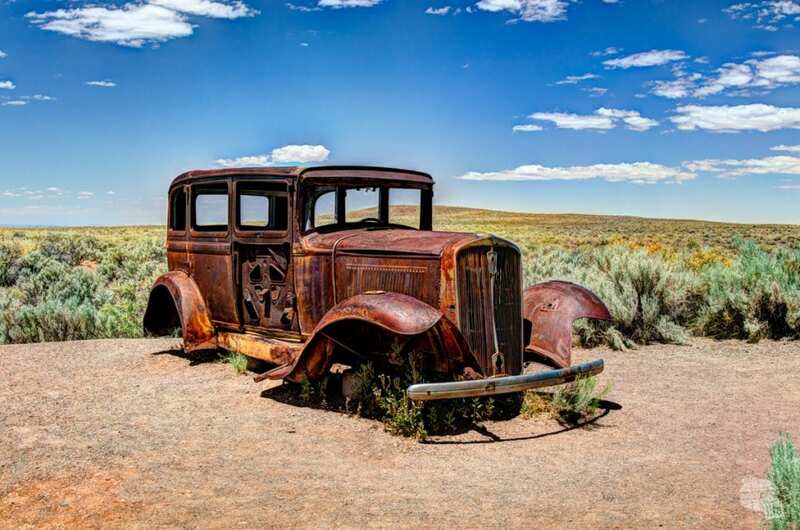 This 1932 Studebaker sits where Route 66 used to cut through Petrified Forest National Park. 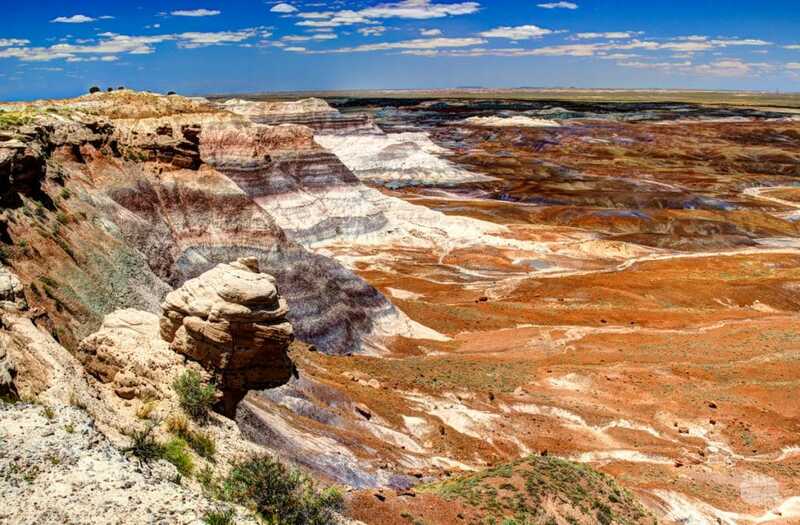 Petrified Forest is a very easy National Park to visit as you are diving I-40. The main park road runs from I-40 south to U.S. 180. Highway 180 intersects I-40 about 27 miles west of the northern park entrance. While a stop here will add a couple of hours to your drive time, it is easy to do driving either east or west on I-40. Petrified Forest National Park is an easy detour off I-40 and provides a great break from the Interstate. We drove through on our way from Albuquerque, NM to Flagstaff, with the camper and the cat! Petrified Forest NP was a welcome detour, even if the circumstances weren’t ideal. We will definitely have to come back sometime when we can get out and do more. 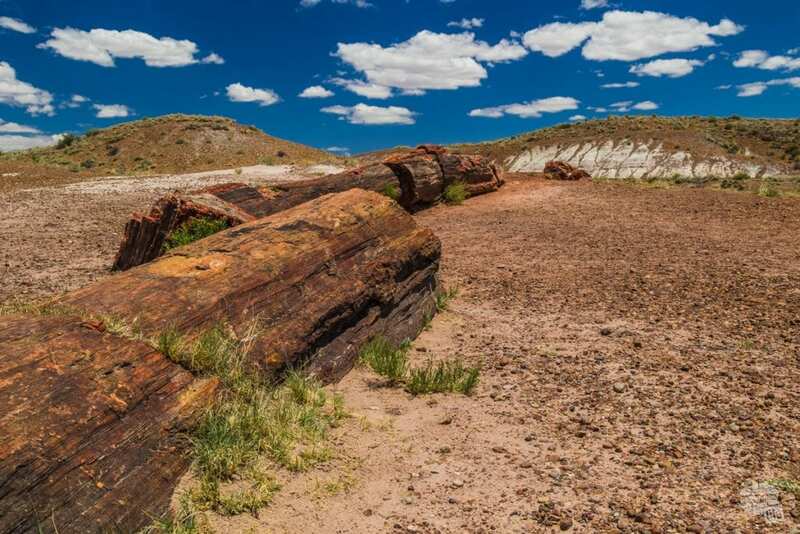 The park protects one of the largest petrified wood deposits in the world. It also includes a beautiful painted desert. We started at the northern end, which is right off the interstate. At the visitor center we picked up the park brochure, watched the 20-minute park movie and got our souvenir magnet. We spent about two hours driving the park road. Along the way there are many pullouts, which are actual parking lots, allowing you to get out and see the sights. We had no problems parking the camper. Our biggest issue was not being able to leave the cat in the hot truck. That meant a lot of keeping the engine (and AC) running while we hopped out to see the views and take some pictures. That said, the entire park is pet-friendly. If Alee would actually walk on a leash, we could have taken her out with us! The northern end of the park is mostly painted desert with amazing landscapes. The southern end is where you will find most of the petrified wood. There are also some short hikes that we didn’t get to do since we had Alee with us. As you get to the south end of Petrified Forest National Park, you will find lots of petrified wood scattered about. We definitely plan on coming back one day to do some more hiking and exploring. But for now, this park was a much needed three-hour break from driving along I-40! 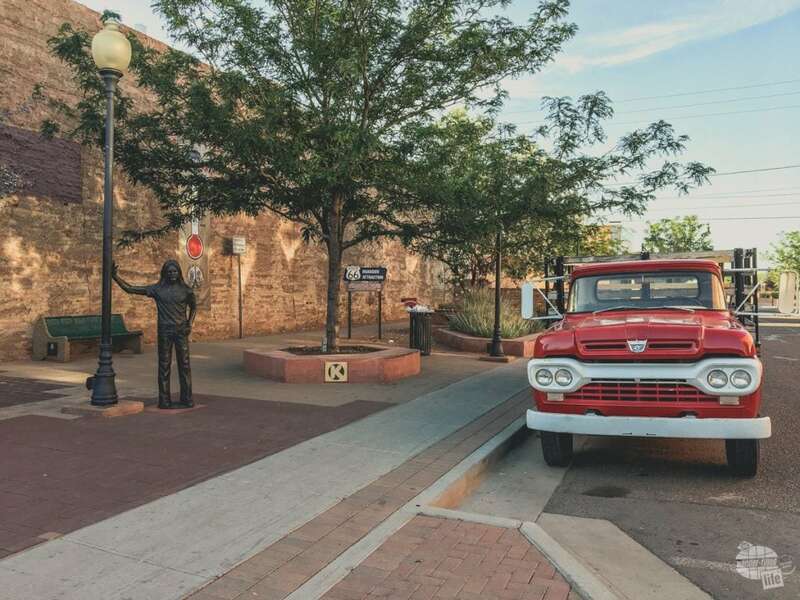 The Eagles made Winslow, Arizona famous and the town has embraced it. Winslow has capitalized on its’ fame by creating the “Standin’ on the Corner Park,” which is right downtown. It is a very nice corner, complete with a statue of Glenn Frey and a flatbed Ford truck. Additionally, the Route 66 gift shop across the street has great memorabilia and plays music by the Eagles inside and out! 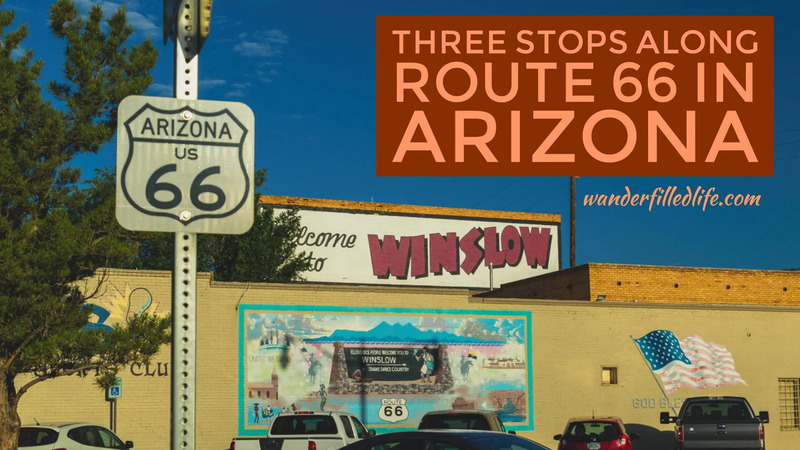 Up until the 1960s, Winslow was a booming town just off Route 66. When I-40 was built, bypassing the town just to the north, that changed. Today, Winslow is not much of a town at all… restaurants were nearly deserted at 6:30 on Saturday night. But, it only takes about 20-30 minutes to hop off the interstate and snap a few pictures. It really is a fun stop! 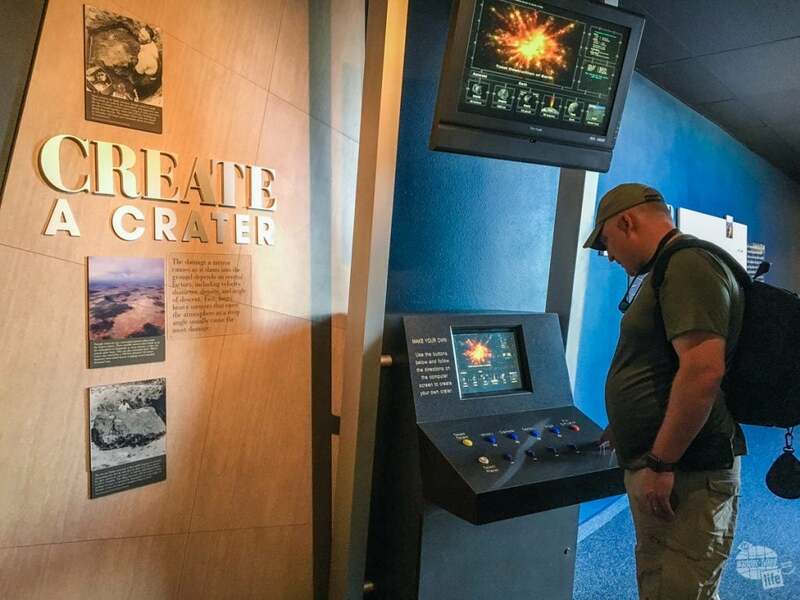 Located just off I-40 (and historic Route 66), Meteor Crater is the first proven and best preserved meteorite impact site on Earth. It is about 20 minutes west of Winslow and 40 minutes east of Flagstaff. We camped at the Meteor Crater RV Park. Though situated behind a gas station, we really enjoyed the campground (you can read our review on RV Park Reviews here). 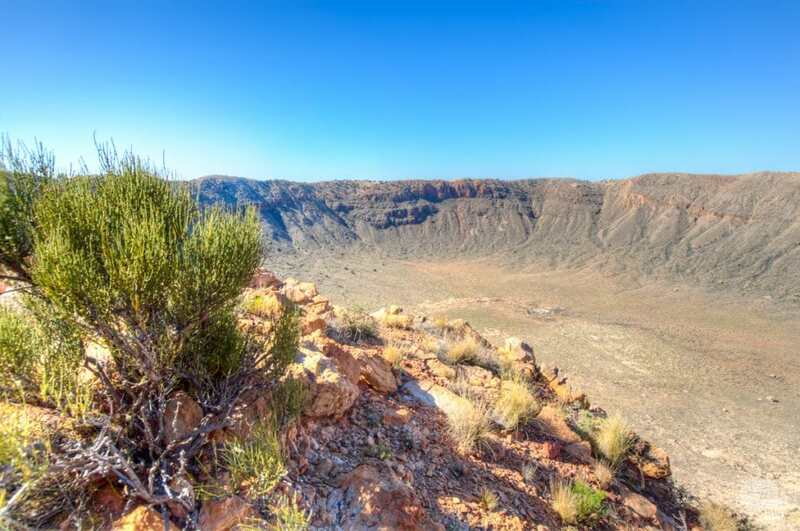 Meteor Crater was formed 50,000 years ago when a meteor traveling about 26,000 miles per hour collided with the earth, forming a crater, which is about a mile across and 550 feet deep. The terrain of Meteor Crater resembles the moon, thus NASA has used it as a training site for astronauts. Meteor Crater is beautiful and staggering at the same time. For us, this stop is a rare non-National Park visit! The facility charges an $18/person entrance fee, which is a little high, but worth it. Your entrance fee covers the Discovery Center, a short film and a guided rim tour. We really enjoyed the facility, so we can’t complain too much about the price. The Discovery Center is an exhibition hall full of information about meteors. Topics include the anatomy of a meteor, various meteorite impacts around the world, a history of the research at Meteor Crater and all kinds of cool Earth-Space Science stuff. The STEM teacher in me was really interested in this! The movie covered the formation of the meteor crater and the research that went into proving it was formed by a meteor and not a volcano. While brief, it was informative and interesting. It plays twice each hour. Grant can’t help it… He just enjoys blowing stuff up. We visited first thing in the morning, before hitting the road. Unfortunately, the first guided tour wasn’t until later in the morning (9:15). We did not want to wait around, so we walked through the observation area on our own. While we would have enjoyed the guided tour, especially since we paid for it with the admission fee, we did not feel like we missed anything. I would schedule an hour or two for your visit. Our visit lasted about an hour; add another 30 minutes for the guided tour. 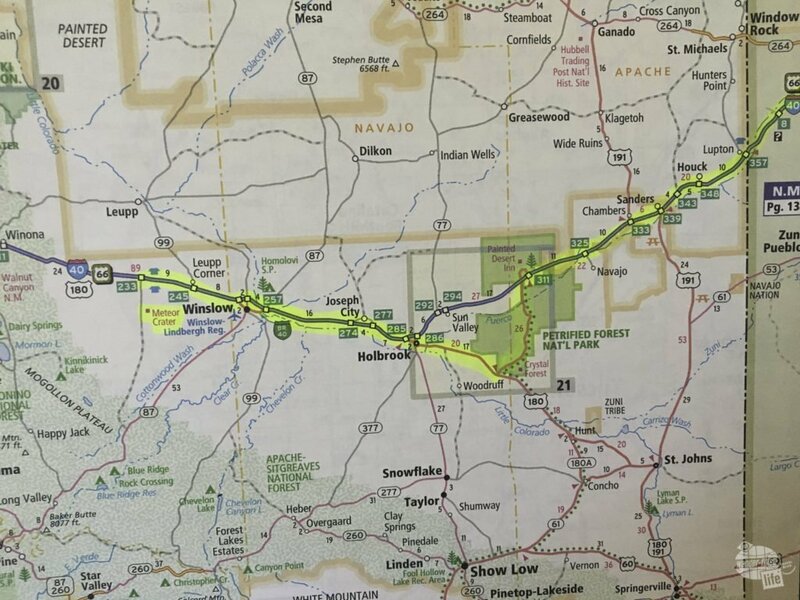 This is a very easy attraction to do as you are driving I-40 (historic Route 66), as it is just about 5-10 minutes off the interstate, with no traffic to fight with. The gift shop even has a lot of Route 66 memorabilia. These are just a few of the many interesting stops along I-40 and historic Route 66. While we had a strong desire to get to California as fast as possible, having some fun stops along the way makes it a much better trip. Even though we did not set out to drive Route 66, we ended up enjoying our drive and finding fun and interesting things to see! A native of Florida, and long time resident of Georgia, grew up traveling most every summer with her family. 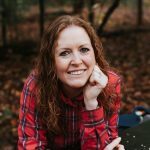 As an adult, her love of travel and passion for educating and helping others, led her to start Our Wander-Filled Life with her husband, Grant.